November 28, 2018 11:25 pm. Meydan Group has released the list of horses accepted for the 2019 Dubai World Cup Carnival, which commences on January 3, 2019, at Meydan Racecourse. The list features 202 accepted horses conditioned by a total of 71 trainers from 17 countries. Several international stars are set to travel to Dubai this winter to compete for a share of the US$12,670,000 prize money—an increase of 12% from 2018—across 10 race cards, including 61 Thoroughbred races and 4 Group Purebred Arabian races. In its 16th year, Dubai World Cup Carnival will take place on nine consecutive Thursdays, from January 3 through February 28, before ending with Super Saturday, March 9. 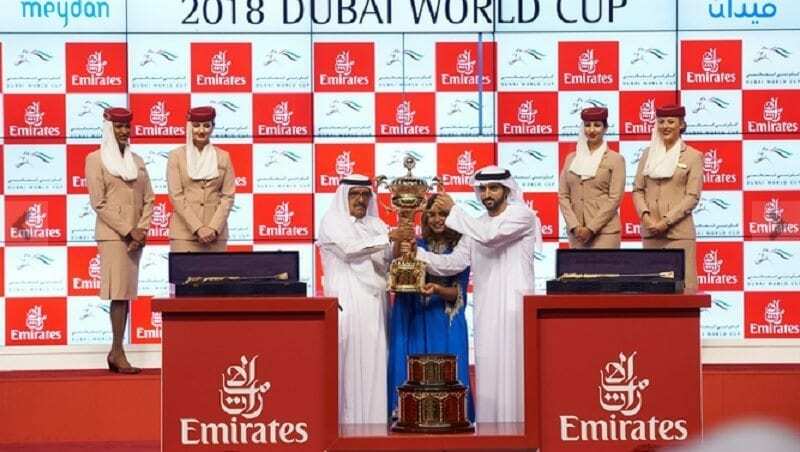 Super Saturday’s race card, which has been boosted to a record $2.65 million in prize money, will once again be a dress rehearsal for the world-record $35 million Dubai World Cup card on March 30, 2019. The three rounds of the Al Maktoum Challenge have received purse increases: Al Maktoum Challenge Round 1 (Group 2, 1600m, January 10) is now worth $350,000; an increase of $100,000. Al Maktoum Challenge Round 2 (Group 2, 1900m, February 7) is now worth $450,000; an increase of $200,000. Al Maktoum Challenge Round 3 (Group 1, 2000m, Super Saturday) is now worth $600,000; an increase of $200,000. Eight of the previous 19 Dubai World Cup winners have competed in the series, including four of the last seven. Super Saturday’s Jebel Hatta (Group 1, 1800m turf) will increase $100,000 to $400,000. Other increases for Super Saturday: Dubai City of Gold (Group 2, 2410m turf) will be worth $300,000 and the Al Bastakiya (Listed, 1900m) goes up to $300,000 as the prep for the richest dirt derby in the world, the $2.5 million UAE Derby sponsored by The Saeed & Mohammed Al Naboodah Group (Group 2, 1900m). Three individual races on the same evening increase by $150,000 to boast purses of $350,000: the Mahab Al Shimaal (Group 3, 1200m), Burj Nahaar (Group 3, 1600m) and newly upgraded Nad Al Sheba Turf Sprint (Group 3, 1200m turf). Dubai World Cup Carnival handicaps will receive increases ranging from $10,000 to $15,000, with the minimum total purse being $135,000 (for horses rated 90-105) and rising as high as $175,000 (for horses rated 90 and up).